Special Summer Offer - a massive 20% off Revolting Rhymes prints when you sign up to our emailing list in "Keep Informed" above. Use REVOLTING20 as client code in the onliune checkout and hit "Check". 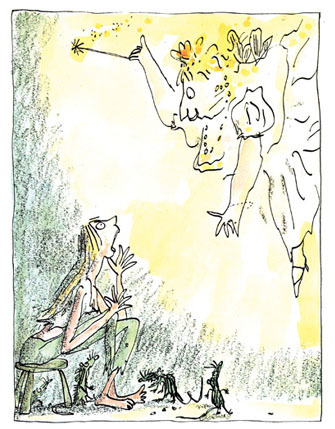 Wicked beasts, brazen crooks and a ghastly giant star in these hilarious nursery rhymes.... Quentin Blake illustrates the key moment from each story and this is presented with with the relevant lines of Dahl's text in every Collector's Edition print. Each unframed print print comes double-mounted and cellophane-wrapped. 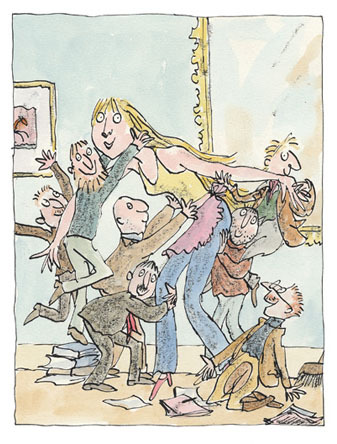 Prints are fully approved by Quentin Blake, blindstamped and numbered, but not signed. A certificate of authenticity is included with each.